Finally I get to publish a blog post on myself. Now you may think that I've self obsessed but seriously if you all go through my blog, I've only been writing on other websites or companies from the past so many days. Anyways, so as the good old days are back, (I mean summer vacations) I've got all the time in this world to do random stuff. Today I had my first photoshoot and I know I sound totally hyped about it but apparently it was my first photoshoot so you can't really blame me. It was a total lunatic day. We all went fanatical and I'm sure the photographer went all crazy. That's it for now. Will write soon. The internet is flooded with online fashion stores. You'll find more pages of online stores than of Hollywood actors. But it's not necessary that one page is`equally good as the other one. Thus, I bring forward Oxolloxo to you all. Pronounced as oksa lock so, Oxolloxo is an India based online website which revolves around women, men and kids fashion wear. This specific website focuses on providing satisfactory clothes to the entire family and not just to one member. A totally new emerging brand competing with so many existing fashion websites may not be so popular but their variety is astounding. You're going to find great stuff and not just beach wear and daily wear clothes but clothes for outings too. Like I earlier mentioned, the variety is huge. 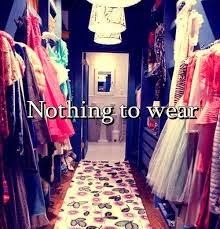 That's the story of every girl. We've got a closet stuffed with clothes yet it is never equivalent to the number of outings we have. Now here's a plus point which Oxolloxo offers. Under the Women's section, they provide us with tops, shirts, elastic pants, skirts, beach wear, palazzos and a lot more. Now as my personal observation has showed me, men don't really focus on clothes which they should. But here comes Oxolloxo with good suitable shirts. So for all men, start ordering new shirts through the mentioned link. The prices range from $22 to $34. As toddlers we never got a say for our clothes. No matter how many tears we might have shed, our parents got us clothes which they thought were good. But clothes demand style and that's what Oxolloxo offers for kids from age 2-14 in the kids section. I can happily jump back to the age of 5 so that I get to wear the clothes designed by Oxolloxo. Do check out this amazing website. They will satisfy you for sure! Now that I've reached the age where an eye liner is a necessity, I've realized how important it is to choose a good eye liner. I'm pretty sure that 80% of girls have used bad eye liners once in their lifetime and regretted it. At first, you might think that what's the difference between any eye liner? They all may seem the same but in reality there's a huge difference. You don't want your eyes to get all watery and your eye liner all smudgy. But if you choose a bad eye liner, you're gonna face all of that. Sephora is a certified brand which is liked by all girls. They have a huge variety in makeup, skin cares, gift pallets etc. Sephora's eye liners are smooth and not watery. My first choice in eye liners would be Sephora. The range starts from $5. M.A.C has been well known for their quality since centuries and you can anyday choose a M.A.C eye liner over other brands without fearing the quality. The range starts from $16. This brand is my mom and sister's favorite. Ever since my observation skills improved, I've only seen them use Revlon eye liners. Thus, this one brand is suggested with my personal guarantee that you wont regret using Revlon. The range starts from $12. You're never going to find a more chic brand than L'Oreal. They offer the best products in reasonable prices. Not to forget L'Oreal is one of the leading brands for cosmetics. L'Oreal also has a unique collection of eye liners. The range starts from $21. You don't want to be fidgety with your eye liner again and again and Maybelline eye liners never disappoint you. Have fun choosing which eye liner suits you. Happy new month to all readers and bloggers. FYI, this month also happens to be my birthday month. (Yeah, I'm acting like a typical girl) So recently, I crashed at Forever21 and the one hour I spent there happened to be the happiest hour of my day. Forever21 is currently the hot favorite of every girl who loves accessories. They have been providing cheap and better quality products than Claire's and mind it that Claire's was my favorite for accessories. Forever21 is making all girls' dreams come true as they have put 30% off on all accessories. From neck-pieces to snapbacks, you'll get a discount on any type of accessory. Welcome to my happy place. This is where my love for fashion and writing comes together. Here, I tell my readers about all those things they should be knowing about fashion and lifestyle. I also share my ideas, outfits and every other thing which fascinates me. Purely started as a hobby, Trendy Mannequin has today become a portal to fashion and lifestyle for many. My Experience of BloBar- India's First Only Blow Dry Bar! Do You Care When Someone Copies Your Style? For The Love of Ethnic Wear.